Contracts are documents which define legal terms like NDAs, Privacy Policies or TOCs, they can also describe for example, design rules which have to be followed. Contracts can be defined for organizations and/or customers hierarchically. A contract can contain text, a file (like a pdf with more information or design elements to follow) and a description. Furthermore, a valid date can be set which will enable or disable the enforcement to accept this contract. SuperAdmin can define contracts for all organizations and customers, as well as for special customers or organizations. 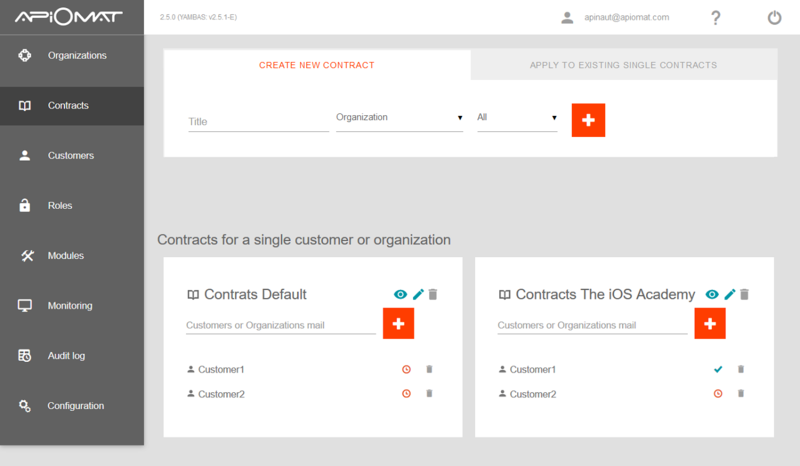 Organizations can also define contracts for their customers. Like SuperAdmin, contracts can be also assigned to special customers.